I'm normally not really cut out to be an outlaw. Whether I'm playing Witcher 3 or Jedi Knight, I've always tended to favor the light side over the dark. And yet, here I am in Red Dead Redemption 2—with my honor firmly in the tank as I've gone full outlaw. I've done some unspeakable things in my journey from Valentine to Saint Denis and beyond. I've accidentally shot innocent train passengers in the course of my robberies. I've set police officers on fire. Everywhere I go, chaos seems to follow, whether I intend it or not. Lately, though, my focus has been on robberies. Specifically, the quest for the perfect heist. What is the perfect heist? For me, it's getting in, grabbing a huge amount of loot, and getting out before the law arrives. More importantly, it's about keeping the body count to a minimum. Lawman-burning aside, my Arthur Morgan isn't a chaotic evil doofus like Micah. Like most people, my quest for the perfect heist started small. Riding through the countryside near Valentine, I spotted a lone traveler on the road. Pulling up next to them, I held L2 and press square for a forced-sounding, "Howdy partner!" The traveler mumbled something that sounded like "Leave me alone" in return. I decided to escalate. Pulling out my revolver, my forced cheeriness gave way to a harsh croak as I told them they were being robbed. Unfortunately, they had a rifle. Game, set, match. I rode off in search of easier prey. I subsequently realized that it was easier to just push them travelers off theirs horse and dash away. If I was feeling particularly diabolical, I might circle back, hogtie them, and rob them. Unfortunately, I would often be spotted hauling them off the road, forcing me to hurry away before the law could intervene. It soon became clear that robbing random passersby wasn't the most profitable heist, as while it was easy, it also yielded very little return—a few dollars at most. So I got more ambitious. Upon unlocking the Wagon Fence at Emerald Ranch, I started ambushing coaches. This was both easy and relatively profitable. After pushing off the driver, I could ride away quickly and hide, then circle back and earn somewhere in the vicinity of $40. If I was really lucky, there would even be some money in the stagecoach's trunk. There was just one problem: it was too easy. Sure, nabbing coaches was useful for earning a quick buck or two, but it was lacking the thrill of the chase. Like an addict, I started looking for bigger and bigger scores. My first really big heist was in Valentine. While I was standing around drinking coffee in camp, Tilly let me know that there was something strange going on at the doctor's office. A cursory investigation uncovered a suspicious-looking steel door. I had already held up the doctor twice before, so it was remarkable that he even let me into his shop, but he nevertheless greeted my mildly when I stepped through the door. I pretended to spend a moment browsing his wares while edging to the back of the room. Sure enough, there was a locked door. The doctor was becoming alarmed, "There's no need to be back there, sir!" I forced the issue by making him knock on the door. Waiting inside were the O'Driscolls—the gang who serve as your main rivals through most of the story. They were counting money when I appeared in the door, yelling in surprise and leaping to their feet only to be mowed down with six quick bullets to the head. The O'Driscolls were kind of an exception to my "let's not kill people" rule. To my irritation, the law was immediately alerted, presumably by the shopkeeper. As I scooped up the O'Driscoll's earnings, I heard the sheriff's voice floating in through the door, "We know you're in there! Come out!" A moment later, the sheriff moved cautiously into the room. I responded by punching him in the face. Sprinting out the door, I made for my horse and rode into the hills. Not too bad, I thought. Sure, I had increased the already sizable bounty on my head, but I had made out like... well... a bandit. Even better, I had found a powerful Schofield Revolver in a box on the table. Still, I felt like the heist could have been executed even more efficiently. Surely there was a way to get out before the law could arrive. I subsequently moved on to trying to knock off banks after playing a bonus mission from RDR 2's special edition. The mission, which involves a coordinated effort to rob a bank in Valentine, is a delight: a tense and chaotic robbery as you force the teller to open the safe, then frantically crack each safe deposit box before the law can arrive (you can also just blow them up, but the take isn't as high). It concludes with a high speed chase out of town and, if you do it right, a relatively clean getaway. Unfortunately, after much experimentation, I discovered that this heist can't be replicated in the normal run of play. There are additional banks scattered throughout the world, but even if you successfully incapacitate the guard, there's no option to get the teller to open the vault. I wound up dumbly pointing my gun at the teller in Saint Denis and demanding the money out of their pocket as the police rapidly gathered outside. I eventually reloaded my saved game and gave up. This has turned out to be a recurring theme for me in Red Dead Redemption 2. There's plenty to rob throughout the world, from horses to trains to stagecoaches to shops, but it's rarely rewarding. There's no way to, say, jump a shopkeeper from behind, tie them up, rob the register, and bail. You have to point your gun at them to unlock combat options, upon which the law is instantly alerted. Point a gun at one of these poor fools and the law will know almost immediately. How? I guess they're telepathic. The law, incidentally, seems to be in telepathic communication with the local townsfolk. Red Read Redemption 2 takes place in 1899, more than a decade before the mass market introduction of the radio, but they somehow always know when you're breaking the law. Only rarely can you move fast enough to keep them from pouncing. It's an element that winds up clashing with the expectations laid down by Rockstar's open world. On the face of it, you can do basically anything you want. You can feed a poor traveler to a gator if you want. Or rob a house. But practically speaking, character interactions have some pretty rigid rules, limiting the possibilities of dynamic heists. If you want a truly exciting heist, you're better off taking on one of the many sidequests throughout the world. Homes will usually be closed to you, for instance, but every so often you can take on a home invasion quest with another gang member. In Strawberry you can find a disenchanted post office worker who will give you tips on lucrative (but heavily guarded) coaches to attack, leading to that delightful moment when you toss a stick of dynamite in the road and watch as men and horses alike erupt into the air. It's the nature of Red Dead Redemption 2, which leans more heavily on bespoke setpieces than you might expect. It's hard to properly pull off emergent robberies in a game built around the maximum amount of detail and immersion. Still, it's frustrating when, say, the law is immediately alerted in the course of a store robbery, or you can't get a teller to open a vault. In the end, though, I was still able to pull off my perfect heist. It took place on a train—perhaps the most difficult and exciting place to attempt a robbery. Trains are loaded with passengers and valuables, but they're also filled with guards. If you want to maximize a train heist, you have to do everything perfectly. Here's the basic gist of it. First, you buy a train ticket (or hop a passing passenger train) and hide at the back of one of the passenger cars, where you wait until it's safely out of town. Once you're firmly in the wilderness, you climb to the top of the train and make a beeline for the engine, where you tell the conductor to stop. The guards quickly attack in force, but after disposing of them, you have a few minutes to blow open the safe, rob some passengers, and bail out before the law arrives. If you do it right, you can easily earn in excess of a hundred dollars. I was able to do basically all of this, but here's the kicker: I never had to kill any guards or lawmen. Even now, I'm still not sure how to replicate how this feat. Here's how it went. 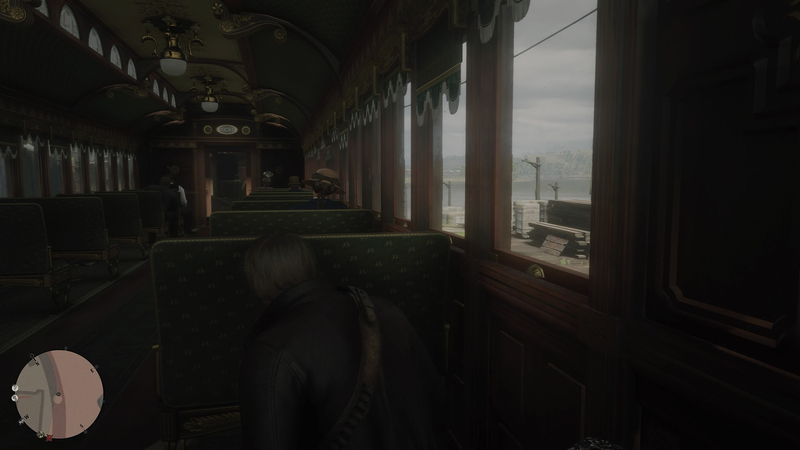 I began in Saint Denis, sitting in a passenger seat and watching the city roll by as I patiently waited for the train to get out of town. This element is slow and frankly kind of boring. As in real life, robberies involve a lot of scouting and waiting, with the actual action being finished in just a few minutes. I've done a lot of waiting in Red Dead Redemption 2. I've done so much waiting in Red Dead Redemption 2. Evenutally, though, the last house faded in the distance and it was showtime. Pulling up my mask, I began quickly robbing passengers, intending to jump off the train and bail before the guards and the law could be alerted. But, of course, the guards showed up just as I was finishing up the first car, forcing me to bail out. A chase ensued as I sprinted into the hills, the law having now been alerted. Thankfully, I was wearing a different outfit than usual, so they didn't know that it was me. I sat waiting in a bush with baited breath as the "Investigating" clock ticked down, finally breathing a sigh of relief when they dispersed. I gathered up my horse and prepared to leave. As I crested the next hill, though, I saw the train. It was still sitting there, eerily silent, no guards or passengers in sight. I approached the darkened train cautiously, uncertain what to expect. Would I be jumped by a guard? Spotted by a passenger? As it turned out, the train was totally abandoned, and there wasn't another soul in sight. I hastily set to work blowing the safe with my dynamite, my eyes wide growing wide as I pulled out more than $200 worth of money clips and valuables. It was easily my biggest take to that point outside of a story mission. I looted that train from stem to stern, even grabbing canned peas from the caboose. As I departed, I was convinced that I had found out how to reliably commit the perfect heist. But alas, that robbery appears to have been miraculous fluke. In one subsequent attempt, I was surrounded and killed by the law. In another, I evaded the law, only to return and find that the train had departed. The time-consuming nature of the robbery has since pushed me to other targets, specifically the stagecoach missions. 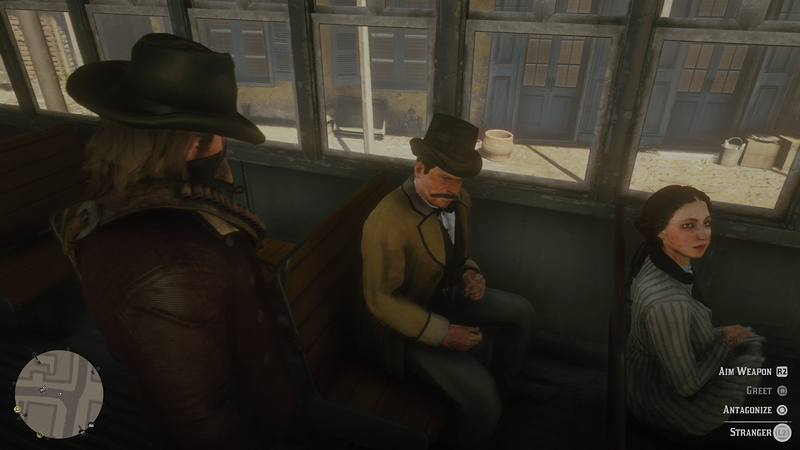 I haven't attempted a train robbery in quite some time (I did, however, hijack a train and go for a merry ride through the countryside, a veritable army of lawmen hot on my trial). I suspect I'll never be able to pull off this type of heist again. Red Dead Redemption 2 is one of those games that's more enjoyable if you operate within its specific boundaries, as it allows you to experience the full breadth of Rockstar's meticulously constructed setpieces. It almost makes the open world elemnts feel like a waste if you're not hunting or fishing, especially with money being extremely plentiful by Chapter 2. But for just a moment there, I was in outlaw heaven—a totally empty train laid open for me. I don't know if I'll ever experience anything like it again, but the perfect heist sure was fun while it lasted. Tagged with Feature,	PC,	PlayStation 4,	Rockstar Games,	Xbox One.